Academy Award-winning filmmaker Peter Jackson returns to Middle-Earth in The Hobbit: An Unexpected Journey, the exciting and visually stunning first installment of a three-part trilogy adapted from J.R.R. Tolkien’s masterpiece, The Hobbit. Jackson will expand the originally slender children’s story into a larger prequel and companion piece to his earlier The Lord of the Rings, while also drawing on the Appendices from The Return of the King. At the New York press day, Jackson revealed how he plans to weave it all together into an exciting cinematic experience that fans can one day watch back to back with his Lord of the Rings trilogy. He talked about why he decided to direct after Guillermo del Toro withdrew, the creative way he accommodated Martin Freeman’s commitment to the Sherlock series so he could play the critical role of Bilbo Baggins, how recent technological advancements altered his approach to the film, which parts of the story he enjoyed expanding, why shooting 48 frames per second created a greater sense of reality and immersion in 3D, and how he feels about post-converting the original trilogy into 3D. Question: It’s a slender children’s story, the Tolkien Road. The movie is going to be three parts. Why? 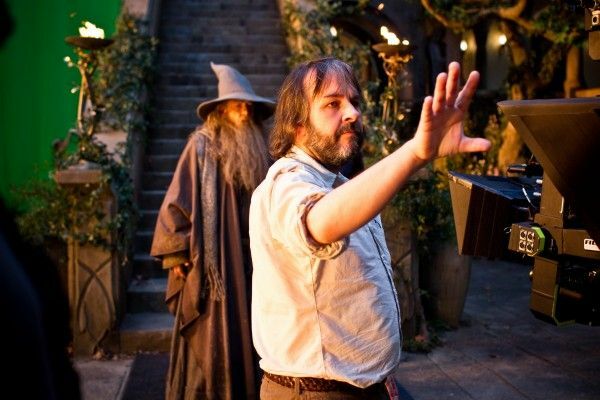 Peter Jackson: It’s a very good question, and it surprised us a bit too, I have to say, because we were originally doing two films. But, it’s really a question of what you leave out. It’s a misleading book. It’s written in a very breathless pace so that pretty major events in the story are covered in only two or three pages by Tolkien. It’s written almost like a children’s bedtime story. Once you start to develop the scenes, and plus you want to do a little bit more character development and character conflict than what was in the original book, plus the fact that we can also adapt the Appendices from The Return of the King, which is a hundred odd pages of material that Tolkien developed, so it takes place around the time of The Hobbit, we want to actually expand the story of The Hobbit a little bit more. Tolkien himself wrote that material to tie events a little bit more into The Lord of the Rings, which is a book he wrote 17 or 18 years after The Hobbit. So, all those factors combined give us the material to do it. Also, it goes back to the Appendices. We can adapt not just The Hobbit, but we can also take these Appendices which are at the end of The Return of the King, which has material that Tolkien was developing for I think what he was considering to be an expanded version of The Hobbit. He wrote The Hobbit in 1937 and then The Lord of the Rings came out in the early 50s which was supposedly supposed to be a sequel to The Hobbit, but it obviously developed and expanded into something much more apocalyptic and the tone was different. And so, I think he was intending to go back and actually revise The Hobbit or write a companion novel to The Hobbit that was going to tie it all together more, and he never did publish that book or even finish it, but a lot of the material his son published in the back of The Return of the King. They talk about the White Council and the Necromancer and they refer to the attack on Dol Guldur and various plotting limits, and it’s that type of plot that we are developing into The Hobbit. It’s all still part of the Tolkien myth. How did you settle upon Martin Freeman for the role of Bilbo Baggins and what was the casting process like? Jackson: The story with Martin really was ultimately simple but it had complexities. I mean, Martin was the only person that we ever wanted for that role. Even before we met Martin, we knew him from The Office and The Hitchhiker’s Guide to the Galaxy. We just felt that he had qualities that would be perfect for Bilbo, sort of that very essential, fussy English, slightly repressed quality. We thought he’d be very good at playing that. He’s a dramatic actor. 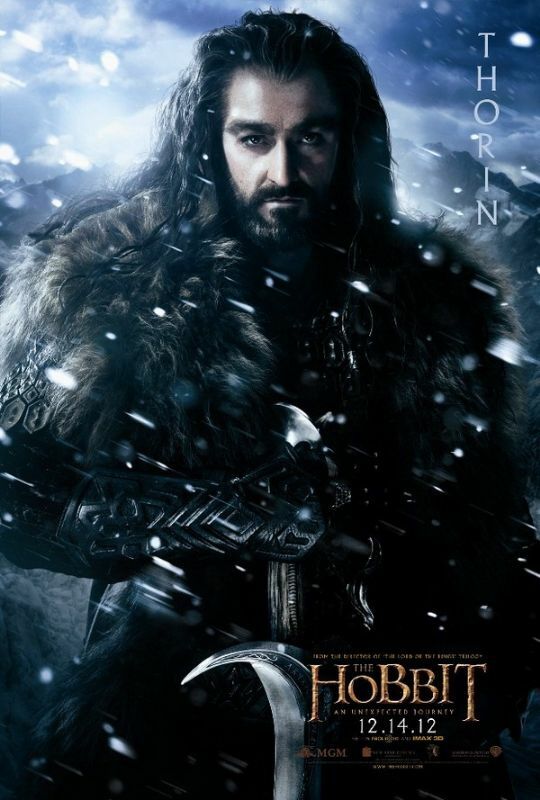 He’s not a comedian, but he is a dramatic actor that has a very rare, comedic skill that was going to be important because there was a lot more comedy in “The Hobbit” than there was in The Lord of the Rings film, and it’s comedy of a ‘fish-out-of-water’ nature, too. It’s Bilbo reacting in a very reluctant way to the adventures that he finds himself in. We thought Martin would be great for those, and we met him early in pre-production, and we really locked into him for the role. And then, with the delays that happened, which were mainly due to the MGM financial situation, the delays were 18 months’ worth of us developing the movie but not being able to get a green light, and so we couldn’t offer the role to anybody. We couldn’t do anything contractually, and by the time we were able to offer Martin the role, he had committed to the Sherlock TV series. He shot the first season, but the second season of Sherlock was going to fall right into the middle of our shoot. And so, he said, “Listen, I just can’t do it, unfortunately.” He had already done this prior commitment. We were in trouble. I was really panicking. We all were. We looked at other actors possibly, but at least we got this bit of casting right. We knew we were going to be in enormous trouble, and we literally couldn’t think of anyone else that we thought would be as good as Martin, and I was having sleepless nights. We were probably about six weeks away from the beginning of the shoot and still hadn’t settled on anyone else. I was tormenting myself by watching Sherlock on an iPad at about 4:00 o’clock in the morning. The second episode of the first season had just come out on iTunes, and I downloaded that because I love the show. I was sitting there and I was looking at Martin and thinking, “God, there is nobody better. We are insane. This is a nightmare situation to find ourselves in.” So, when I got up that morning, I called Martin’s agent in London, and I asked if we could find a way to accommodate Martin’s schedule for Sherlock for our shoot. 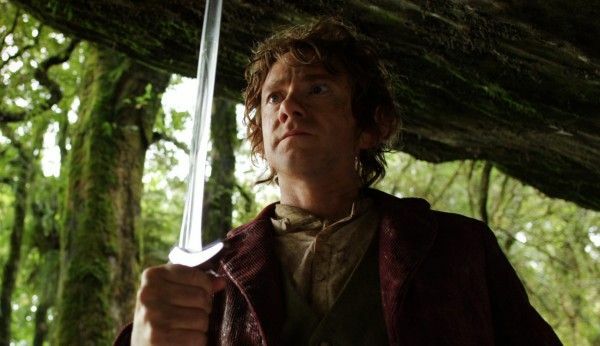 Would Martin be prepared to still come down to New Zealand to do Bilbo? Fortunately, the answer was yes, he’d love that if it could work out. 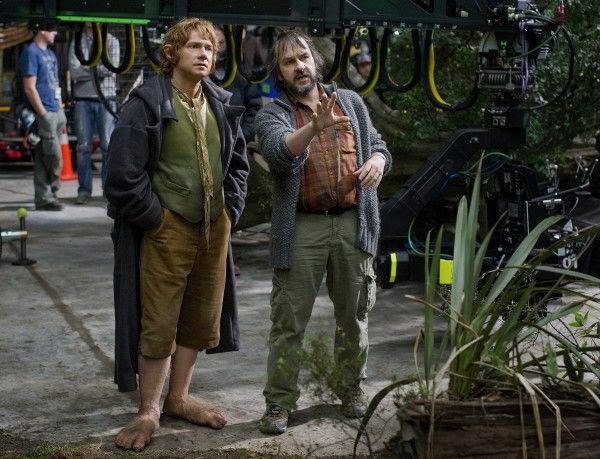 What we did, with the studio’s approval because they felt as strongly as we did about Martin, is we did something very unusual which was we started shooting The Hobbit. We shot for about four or five months, and then Martin had to go and do his second season of Sherlock, and then we literally stopped the shoot for two months or about 8 weeks, and then, when Martin came back, we carried on again. And actually, it was a blessing for us in some respects. Apart from having Martin in the film, I also got time to edit the first four months of shooting, and we got time to prepare for the next batch of shooting because it was 266 days of shooting. It was 18 months shooting these movies, so that little break was very welcome, I have to say. It was quite a civilized way to make a movie at the end of the day and we got Martin Freeman. This is a gorgeous looking movie. Can you talk a little bit about getting everything to look so real — the hair, the make-up and the sets – using 3D, high definition that seems to see everything? Jackson: The levels of detail in the movie are similar to The Lord of the Rings. I mean, with the high definition cameras, you see more, so I think we have an apparent sense of more detail, but fortunately the team that we have in New Zealand, Weta Workshop, who designed a lot of the make-up and the effects and our wardrobe department and our art department, we’ve always wanted to put in a lot of detail. A lot of detail never gets seen by the cameras. To me, fantasy should be as real as possible. I don’t buy into the notion that because it’s fantastic, it should be unrealistic, because I think you have to have a sense of believing the world that you’re going into. The levels of detail in that are very important. It’s interesting because 65mm films that people used to shoot were virtually high definition in the film world. It was like HD in a way because it was very fine grained film stock. I’ve always been fascinated by that. When we were setting out to do Lord of the Rings back in the late 1990s, we explored the idea of shooting that in 65mm. There hadn’t been very many films shot in 65mm for a long time. I think maybe Far and Away, the Ron Howard movie, the cowboy film, was about the last film that was shot in 65mm at that stage. The camera equipment was very cumbersome and we were going to have to develop the film in America, even though we were shooting it in New Zealand. We’d have to send the negative to America and then back again. It ended up being not a good idea for us to shoot, but it was something that I wanted to do at that time, because I think with a big screen epic experience, the more detail, and the sharper and clearer you can make things, the more real, the more immersive, is exactly the sort of thing I like. You weren’t always involved as director of this project. Why weren’t you interested in directing it at first? Jackson: That’s a very good question. I guess I thought that I wouldn’t enjoy it is the truth, because I thought I’d be competing against myself to some degree, and I thought it would be interesting to have another director. Guillermo del Toro was involved for a while, for over a year probably. But after Guillermo left because of the delays we were facing with MGM, it was still about six months or so before we had a green light after he left, and during that period of time, I just thought I am actually enjoying this more. We’d been working on the script with Guillermo all that period of time and we were producing it for him. 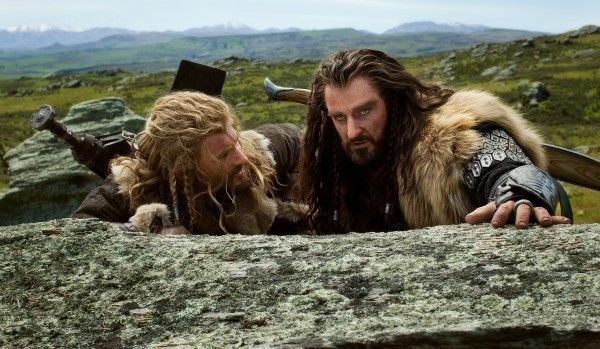 Also, I’d come to realize something which I hadn’t really put my head there, but I’d come to realize that there’s a lot of charm and a lot of humor in The Hobbit that The Lord of the Rings didn’t have. I thought, returning to Middle-Earth and telling a completely different story in a different tone, this is not The Lord of the Rings. I’m not going to try to make another film exactly like that. This gives me an opportunity to do something a little different. That was the reason why I thought it’d be fun. And as it was, after all the trials and tribulations we had during post, the first day we started shooting I was incredibly happy that I was there. It was a great deal of fun to shoot. As a second unit director, to what extent was Andy Serkis involved in the editing and visual effects process for Gollum this time around? Jackson: Andy didn’t start work as a second unit director until after the Gollum scene was finished. The Gollum sequence was the first thing we shot. We filmed that, the Bilbo-Gollum material, in the first ten days of shooting. We didn’t bring the second unit in until two or three weeks into the shoot, so Andy was literally just starting work as an actor with Gollum. But that was a great scene to start with, in a way, because we had a lot of logistical issues on the film to deal with, with 13 dwarves and heavy prosthetics and costumes and a lot of work. They had to be in make-up for three hours a day. It was going to be a very difficult film to make from a logistics point of view, and so, starting the shoot, we were at the foot of a mountain that felt very steep. It was a long, big climb at that stage when you’re at the beginning of an 18-month shoot, but that first week or so of shooting, just having two actors was good. It allowed us to find our feet. It was also Martin’s first week of shooting so, he had to explore the character of Bilbo. It was literally the first time and the first day he had ever played that character when we started shooting that scene, so it was a really great way to start. I felt sorry for Martin because he had Andy Serkis coming at him with full energy, and here was Martin trying to figure out, “Who’s this character I’m playing? How would he react to this?” It was good for me and Martin that we were able to work together and actually work our way through different ideas for how Bilbo would deal with Gollum. It’s tricky when you’re shooting a scene in the middle of a film to make sure you get the tone right, because you’ve got to think of everything before then that you haven’t shot yet. I decided to give Martin and Andy a chance to develop both the scene and the characters by shooting a lot of the takes. A lot of the camera angles and a lot of the takes we shot the entire scene all the way through. It was twelve pages long, so it was nine or ten minutes worth, and we just lit the camera around them and let them do the entire scene. We didn’t break it up into little tiny bits and pieces as you often do. I did that again for Martin’s sake more than anything just to let him be able to sort of run this through over and over again. We shot many different camera angles on it, but each angle we ran through the whole scene, so it was a week of shooting. 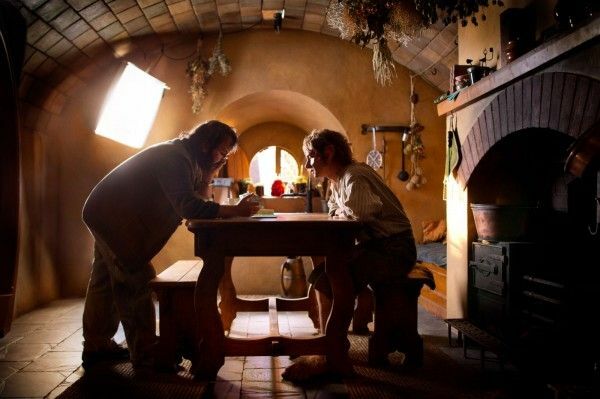 In terms of the screenwriting process, what parts of The Hobbit did you enjoy expanding on the most in this movie that weren’t in the original book? Jackson: A lot of it was from the book. We’ve expanded stuff, like the Mountain Giants. The Stone-giants that are mentioned is like a paragraph in the book by Tolkien. They’re going through the Misty Mountains, and he refers to a thunder storm created by this fight between giants and doesn’t really dwell on it particularly, so those sorts of things were fun. That scene was an incredibly visual scene out of the book that we could develop and expand on. So we did different expansions with the Goblins and other things. There’s a speech that Gandalf gives about simple acts of kindness versus great heroism that’s similar to a theme you were developing in The Lord of the Rings. Can you talk about how you carried that theme through in this film? Jackson: One of the things that I really like and this is what made this film a joy for me was being able to almost connect little pieces from “The Lord of the Rings” to The Hobbit. There was a scene in The Lord of the Rings in The Fellowship of the Rings, the first film, where they’re in the Mines of Moria and they’re stopped at a crossroads, and there’s a quiet moment where Gandalf is talking to Frodo about the events in The Hobbit and how the pity of Bilbo rules the fate of all, meaning that Bilbo had a chance to kill Gollum but he didn’t, and the fact that he didn’t is now directing the story. It’s now created the story of The Lord of the Rings, for good or for bad. It was really interesting that 10 or probably 12 years after we shot that scene originally to come back and actually show the moment when Bilbo stays his hand. And also, the reason why he doesn’t kill Gollum at that stage where he’s got the opportunity to and he’s invisible and he’s standing over Gollum is because Gandalf has said to him that true courage is deciding when not to kill rather than when to kill. And so, just completing those little loops and circles was one of the really interesting things whilst you’re dealing with a different story and a different tone. I really like the fact, in a way, that if we hadn’t shot the films in this order, we might not really have been able to do that quite as effectively. I’m pretty much aware that once these three movies are done and they’ve had their theatrical life, we’re really looking at a six-movie sit which is the way that it will all exist from that point on. I am very conscious in wanting to make it feel like a very organic story with synergy and everything connecting with each other. It wouldn’t have been that easy if we had shot The Hobbit first, because it is such a different tone of a book. We might have just locked into that much more fairytale tone which would have made The Lord of the Rings, if that had happened second, a much more difficult adaptation in a way, because it would have been hard for the two to talk to each other. So, doing it this way around has actually been a blessing really. What was it like coming back to Middle-Earth a decade later given all the technological advances since The Lord of the Rings? 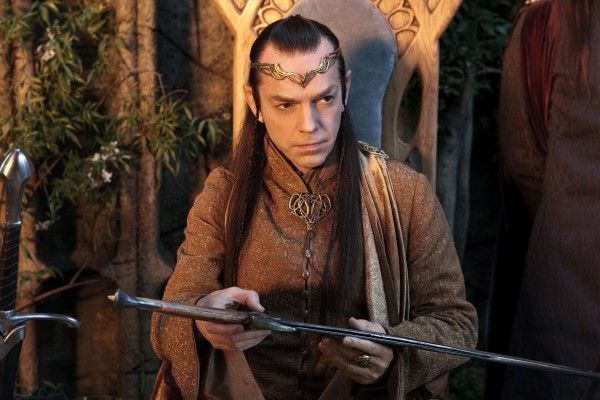 Jackson: In The Lord of the Rings, Andy would perform Gollum on a motion capture stage sometimes six months, sometimes a year, after the live action was shot. He would always be there on set for Elijah (Wood) and Sean (Astin), and the cameras were filming them reacting to Gollum and playing the scene, but what Andy was doing wasn’t getting captured in any way. And then, much later, he had to go [back] and recreate it. Elijah and Sean weren’t there anymore, because it was in post-production, and he was all by himself having to recreate the energy of the first time around. But this time, on The Hobbit, we recorded and the motion capture was being captured while we were filming the principal photography, so when Andy and Martin were acting together, Martin was being filmed with the cameras and Andy was being captured by the motion capture cameras, and all of his performance that he did on that day is in the film. So, it was a much more organic process. 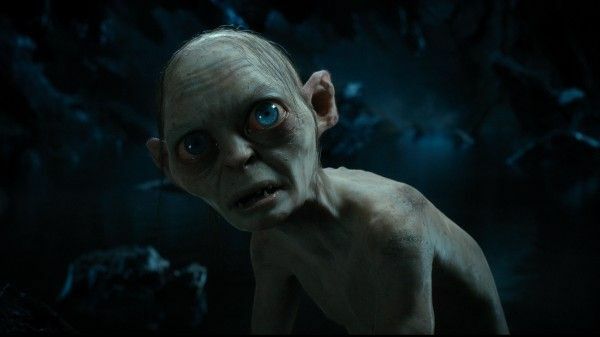 The muscles on Gollum’s face are a lot more detailed and accurate this time around, which means all the nuances that Andy does as an actor can be accurately one-to-one captured and translated onto Gollum. Even though we want Gollum to look exactly the same and to sound the same, the technical side of it is quite a lot more advanced. When did 48 frames enter into the picture and what do you feel it added to the product? What did you learn from people’s reactions to it? But, of course, while there were mechanical projectors in the cinemas around the world, they were locked into 24 frames. It was an infrastructure that had existed since the 1920s that was never going to change. But it’s the advent of digital projectors that allowed all this development to happen. Jabez Olssen, the editor that I worked with, went to NAB (National Association of Broadcasters), which is a technical convention, the year we were in development on The Hobbit, and he came back and said, “You know what, if you’re interested in a high frame rate, I think the moment in time has arrived because the projector manufacturers can probably do it, and the cameras are going to be able to do it.” So we decided to take the plunge. Warner Bros. was very supportive. They just wanted us to prove that the 24 frame version would look absolutely normal, which it does, but once they were happy with that, they were very happy for us. On the first day of photography, we had to push that button and say 48 frames, even though the first day we started shooting The Hobbit at 48 frames, you could probably say that there wasn’t a single cinema in the world that could project the movie in that format, so it was a little bit of a leap of faith. The thing to realize about it too is it is not an attempt to change the film industry. It’s another choice. The projectors that can run at 48 frames can run at 24 frames. It doesn’t have to be one thing or the other. You can shoot a movie at 24 frames and have sequences at 48 frames or 60 frames within the body of the film. You can still do all of the shuttering and the effects, the Saving Private Ryan sort of strobing effects are still capable whether you’re at 24 or 48. It doesn’t necessarily change the way films are going to be made, but it’s another choice that filmmakers have got. And, for me, it gives that sense of reality, of immersiveness, that I love. It makes you feel like you are leaving the cinema seat and actually becoming part of the experience of the adventures of the film. How do you find the experience of watching the film in 3D at a higher frame rate? Jackson: I’ve been watching it for 18 months now, watching hours and hours and hours of it with the rushes and the dailies and then obviously the various assemblies of the film. With 3D, your left and right eye, both of your eyes are seeing a different picture because the two cameras are filming two different pictures from different angles, and with 24 frames, you’re getting strobing and motion blur and the add effects of 24 frames, and those are being shot separately with two cameras being fit into separate eyes, and your brain is trying to put this stuff together. The more add effects and the capture, like when you’re panning or things are moving or strobing, you brain is struggling to try and resolve these two pictures and 48 reduces all of the add effects, and so it does make for a smoother experience. But it’s different, and as human beings, we always have resistance against things that are different and there’s always suspicion. I’m a Beatles fan, and I remember in the mid-1980s, when CDs first came out, there was a sound of vinyl and the sound of the needle on it that people loved, and suddenly CDs were threatening. I remember reading something saying that the Beatles would never have their albums on CD, because it was just too clear, and all the bum notes that they played and all the bad playing would be exposed, and they would never be happy with that, so you’re never going to hear a Beatles tune on CD. There was all this hysteria. It’s just that at the last few minutes we don’t like change. The one thing with 3D presentations is I think that 3D itself, whether it’s 24 or 48, is at a very interesting point in time. I don’t like putting glasses on and watching 3D. I don’t mind wearing glasses, but it’s the dimness of the light and the fact that you’re filtering the light. Whatever 3D process is being used is a filtration of light, which means it’s blocking some of the light. But those days are about to end, and they can’t come soon enough. Laser projectors are on the horizon. And then, in New Zealand, at the premiere of The Hobbit, we took two Christie Projectors, we stacked them up, and we projected the movie with two projectors both onto the screen, and we got the picture as bright as 2D. It was the first time I’d ever seen 3D at the light level of 2D. It was super bright, and you put the glasses on, and it brings it to the same light level as you would get with 2D, and it looked fantastic. I can’t wait for those days to come and we just get away from this dumb 3D, because that’s what’s sort of giving it a stigma right now, and it doesn’t need to be like that. Hopefully, within a year, it won’t be. It’s just that the technology needs to get a little bit more advanced with the projection. How did 3D change your approach to the visual effects and how you directed scenes? Jackson: It didn’t change my style of directing, and I didn’t want it to. That was the beauty. We used RED Epic cameras and 3ality Rigs. I didn’t want to convert it. I wanted to shoot it in 3D because I think that’s much more realistic. But fortunately, we had really great support from those companies who worked with us, and they made the equipment as light and small as they possibly could. The 3ality Rigs were originally made in steel, and they made them for us out of carbon fibers so that we could put them on steadicams and use handheld cameras. I really wanted to be the same filmmaker going back into the Middle-Earth, thinking of that six-film series. I didn’t want, because this was 3D, to suddenly shoot in a different style. I don’t believe in the concept that 3D should be shot separately. I mean, every director has their own style, sure, but I don’t think any of that is really an issue with 3D. For me, it was important to not even worry about the 3D and I didn’t. I didn’t even think about it half the time. I was directing like I would normally direct, and the cameras could do what they normally do, and for me, it was a comfortable experience. Would you ever go back and post-convert the original trilogy into 3D? Jackson: Just to talk about the dimensionalization of the Rings, it’s not really a question for me particularly, because it’s a studio issue, and they would have to pay for it, and it’s expensive and things. I’d be happy to do it and be part of it if they decided. That’s really a marketplace thing. I think that whole idea of dimensionalizing older films is something that the studios are still unsure of. I know that Jim (James Cameron) did a long Titanic and it was very successful, and then George Lucas did it with the Star Wars and it was not so successful financially, so I think the studios are not quite sure at the moment just where that market is going to finally land. I guess, as time goes on and 3D establishes itself more in people’s homes, and the cost of conversion and of converting it comes down, things have to move on, but at the moment, it’s not being discussed. First image from The Hobbit: The Desolation of Smaug. Dave’s review of the film. 6 clips from the film. Steve’s set visit round-up and 70 things to know about the film. Weta Workshop head Richard Taylor on-set interview.